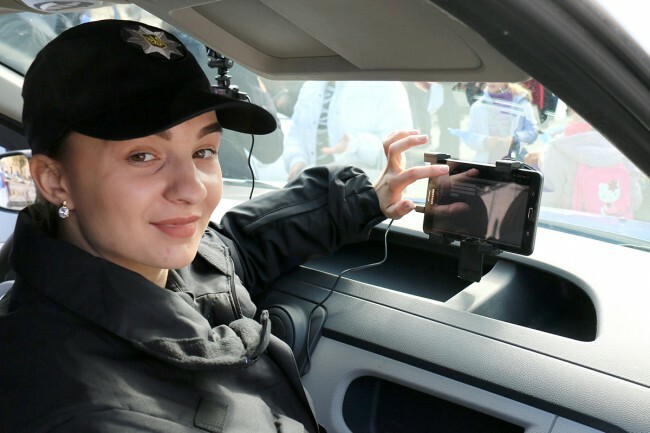 The European Union Advisory Mission (EUAM) Ukraine has donated 74 computer tablets and dash cameras, as well the software to support them, to the Lviv regional police in order to strengthen the effectiveness of Quick Response Teams (QRT) in Lviv region. The donation, which covers the technical needs for police response-team vehicles in Lviv region, is part of EUAM’s engagement with police in Lviv region, building on the success of the ‘Sambir police project’. During the Sambir project, which managed a significant improvement in response times to calls from the public, EUAM and the National Police in Lviv region identified that the major IT need for police stations in mid-sized towns was not computers, but equipment that would support response teams while patrolling. The donated equipment assists the response teams, which will now receive timely assignments via their tablets. The equipment will also ensure traceability of police actions, as well as survey situations on the road and within communities. Dash cameras are effective tools to gain citizens’ trust and strengthen respect for human rights. “This is a follow up to the cooperation between EUAM and the Main Department of Lviv Regional Police which was launched with the Sambir experiment. EUAM donated 74 sets of equipment needed to improve the efficiency of Quick Response Teams. We are grateful to the Mission for this support and believe that this is another step for the Lviv Regional Police towards EU standards”, highlighted Dmytro Zahariia, the acting Head of National Police in Lviv Region. As well as supporting the Lviv Regional Police, EUAM is also making a donation of similar equipment to regional police stations in the Kharkiv and Kyiv regions.